How to prevent heavy rainwater from jumping the gutter? During heavy rain, the water collects from my second floor roof and runs onto the first floor roof as it should. The problem is that since all this water is now concentrated from the second floor downspout, the heavy volume causes it to race down the first floor roof and "jump over" the gutter. Is there any way to prevent this from happening and to what extent is this a normal, unavoidable result of the heavy rainfall? I've looked at "gusher guards" but was warned that these might cause damage to the gutters once Winter hits from the snow and ice pulling at them. I'm in Michigan, so lots of snow and ice. I've also considered adding an extension to the second floor downspout so the water is dumped directly where it should be, but I'm afraid it'll stick out like a sore thumb and look janky. Any suggestions? Is there a "standard" way of dealing with this situation? This is a common mistake, which will lead to premature roof wear. What the installer should have done, was to install an A to B transition elbow, and continued down the roof with a section of down spout. Then used an A elbow to have the water dump directly into the lower gutter. Allowing the high volume of water to flow over the roof, will damage the shingles and cause them to wear prematurely. 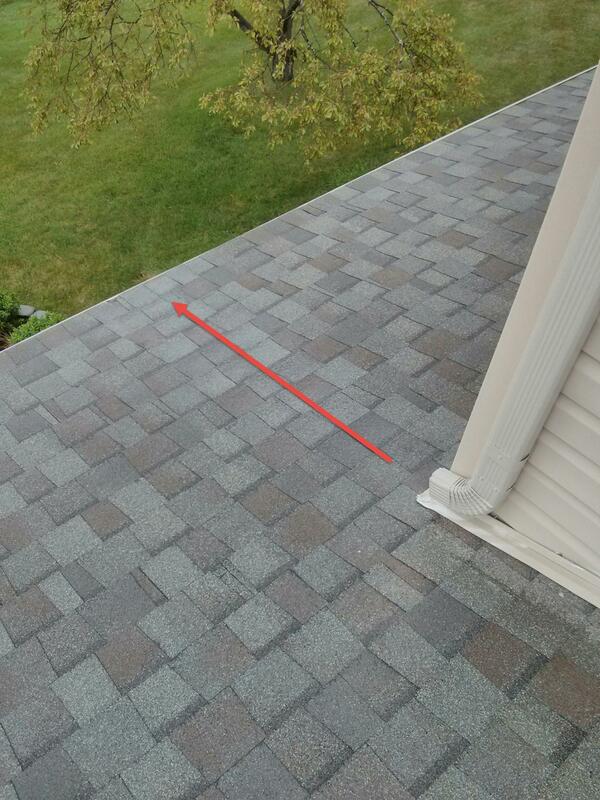 Even if you turn the spout adjacent to the slope, it will still cause damage to the roofing. Spreading the flow over the roof in this way, will not alleviate the damage that is caused. In either case, you're allowing all the water shed from the upper roof, to flow over a small section of the lower roof. It's a terrible idea, and should be avoided. I'm not sure exactly when builders decided to try and save the $10, by not installing the downspout along the roof. But it makes me so sick every time I see it, I just want to climb up there and fix it myself. In this case, since it's really only one spot, I'd probably suggest having the second floor downspout connect to a downspout that runs along the first floor roof, out past the gutter and then down it's own downspout. So you'd take the entire load of the second floor water directly to the ground instead of trying to dump it into the first floor gutter. 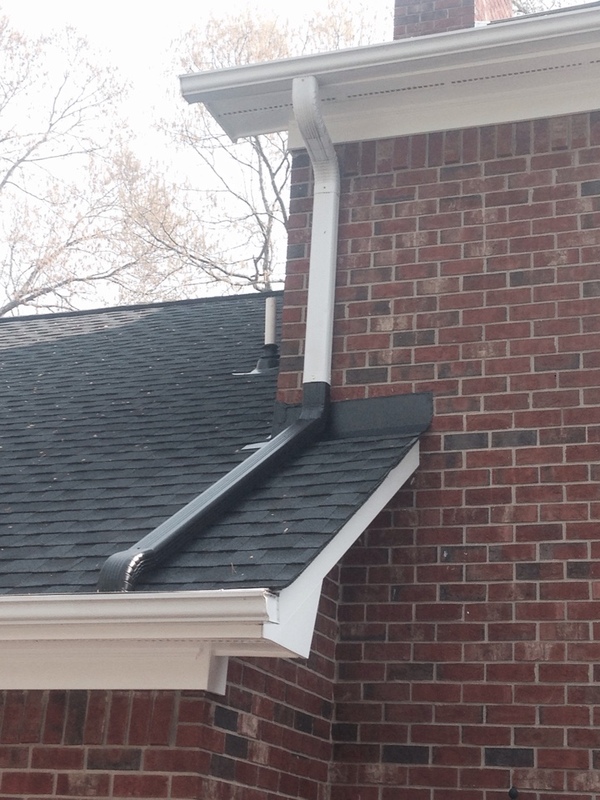 Could you turn the end of the downspout 45-90 degrees so the water exits across the roof slope, rather than down it? This would help distribute the downspout flow across more roof area. Were it me, I'd consider a 'janky' looking roof much better than premature shingle failure due to overload. Run a section of downspout across your roof and dump it into the existing gutter, angled in the direction of flow, so that the water doesn't splash into the gutter at a 90 degree angle, but joins water already headed for the downspout. I had a similar problem caused by the lower gutter being overhung by the roof too much. There was only actually about 1/3 of the gutter 'visible' for rain from the roof to fall into. It was resolved by repositioning the guttering. (In our case that was relatively trivial as the guttering was mounted on extendible brackets fitted to the rafter feet). I don't have enough rep to comment, so in the form of an answer: I fully agree with Tester101. You need to protect the lower roof from a large flow of water in a narrow space and incorporate the elbow at the end to bring it into the gutter. I have a copper tile roof and did something similar to protect it. The differences in my approach were: I used an open channel PVC length (like a length of PVC gutter - may have been something else originally) instead of a length of downspout on the roof itself. This avoided contact of alumninum gutter with copper roof that could lead to electrolytic corrosion and a disappearing roof. It also avoided, or greatly reduced, the risk of a blockage in the section on the roof due to either dirt and leaves or to ice. I have taken these or these to alleviate a similar problem. You would just be tweaking your gutter on your own. You can push up on the gutter and put the screw or bracket in. The hope is that you would be able to do this enough so that the angle of the roof points straight into the wall of the gutter rather than over it. Though my first go would be a 90 degree elbow so that the water spreads out over the roof more. It's standard on new construction around me. It seems to work okay. If yours is "U" type gutter fix "Ç" type gutter so that upper part will prevent water from overflowing when there is heavy rain. See the "Ç" type gutter is little bigger than the "U" type gutter. Not the answer you're looking for? Browse other questions tagged water roof gutters rain or ask your own question. Is the gutter on the side of my roof dormer necessary? Prevent water from overshooting gutter at corner roof valley? How to lay heat cable (de-icing cable)? Should I replace fallen gutters? What are the pros and cons of installing a roof heating cable? How do I repair/reattach downspout and gutter after snow/ice damage? How much drainage pipe should I bury for a new downspout? How can I repair leaks in metal wrapped wood gutters? Will dark gutters stay ice free better than light colored gutters? How do I calculate the size of the downspout I need for a gutter? Correct gutter installation to prevent ice dams? Why is water leaking behind my new rain gutter?